You are currently browsing the tag archive for the ‘renovations’ tag. Once upon a time, way back in 1883, a house was built for a bricklayer. In this house, was a kitchen and that kitchen was 9 x 11 in size. In this kitchen, of course, was a floor. Jump forward to 2012 and that floor is now no more. 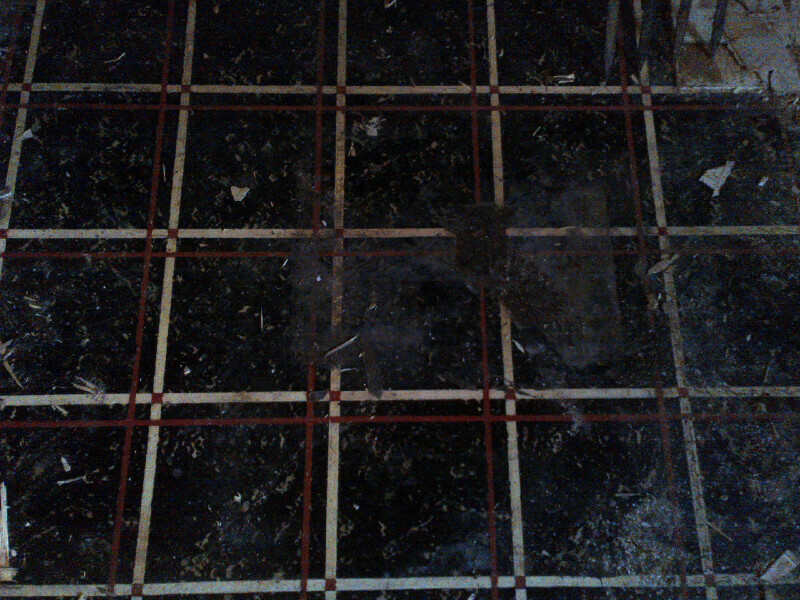 You see, this floor might have been all the rage in the late 19th Century, but subsequent owners felt it needed a face-lift So they covered up the black, white and red grids with another layer. 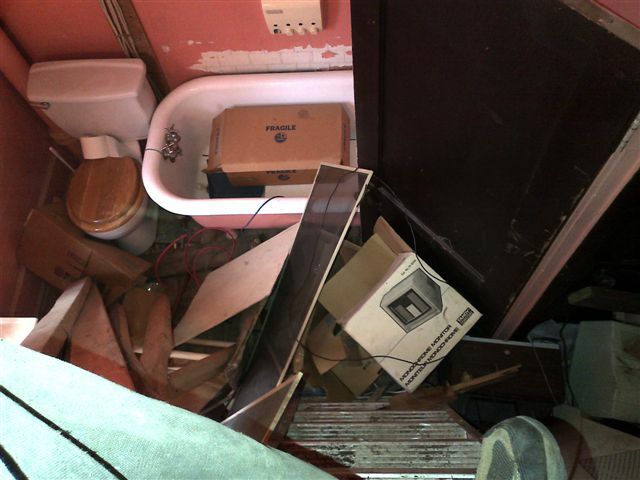 And another, and another, and even one more layer of flooring, til there were five layers of flooring in total. That’s a lot of flooring. And back at 504 Philip, this is what we were left with. 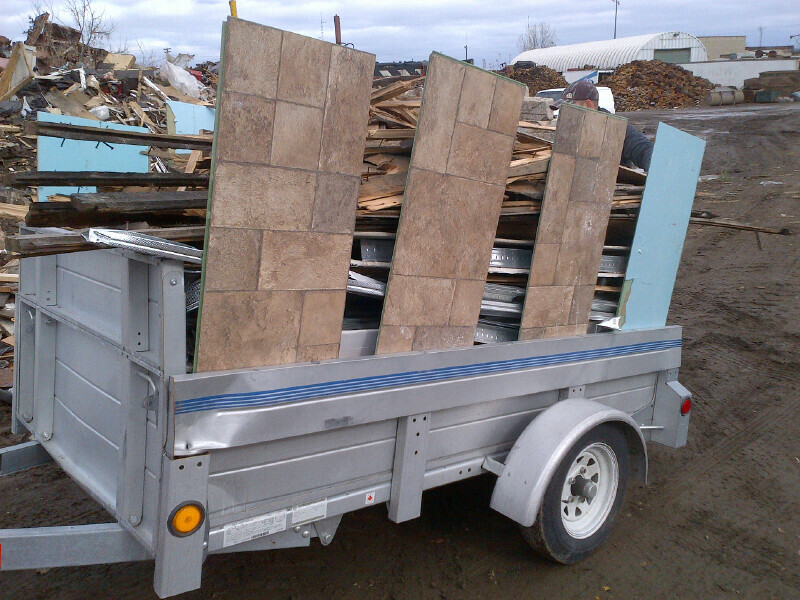 As you can see, the trailer was filled with not just flooring, but everything else that was underneath all those many layers as well. 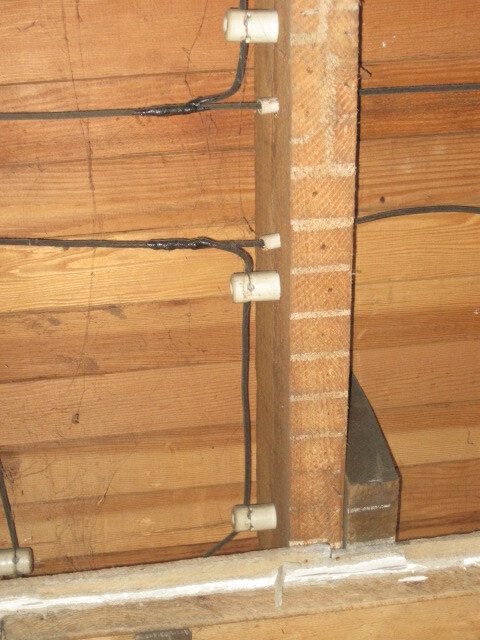 We found loose and rotten floor joists that were not worth trying to save. We stripped it down to the ground. Now don’t fret and run screaming from my FOLLOW THE FLIP just yet. 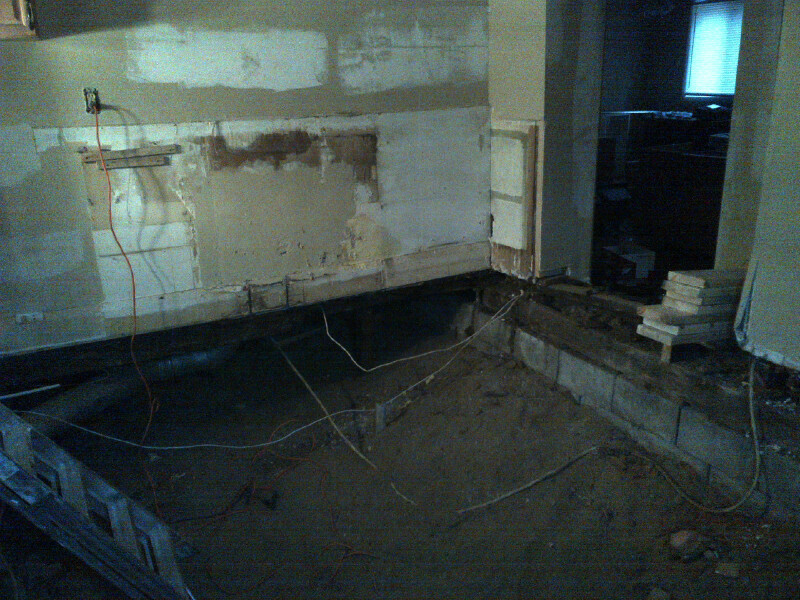 Obviously the kitchen won’t be left like that. New joists were added, a sub-floor was built and a shiny new single layer of flooring will greet you when you enter your new kitchen. 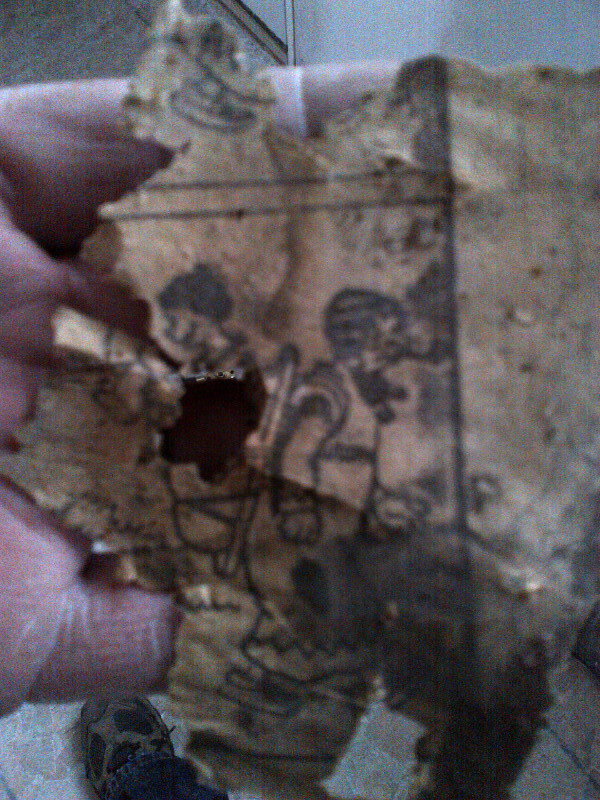 But look what else we found underneath the floor. Anyone familiar with this old cartoon? Let’s go back in time to look at the origins of my newest find. 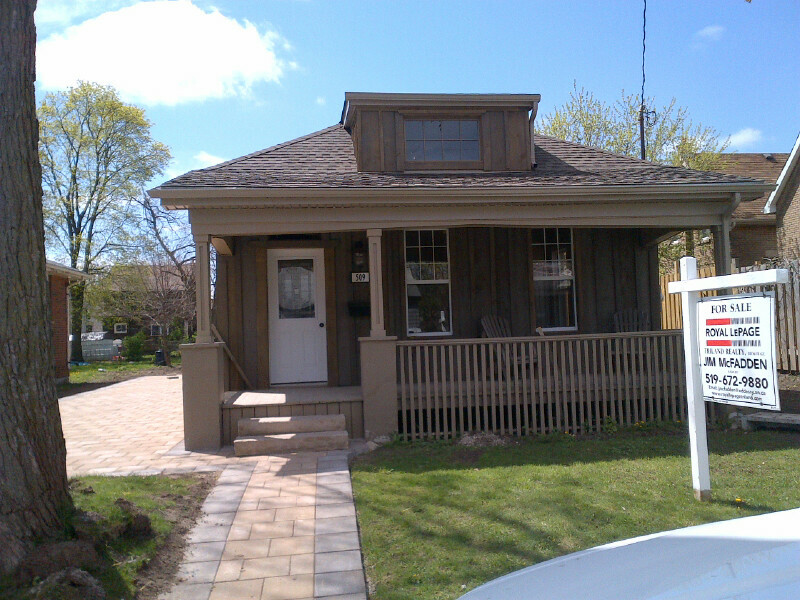 Way back in 1886, the walls went up on this 3-bedroom bungalow at 504 Philip St. in London, Ontario. In other parts of the world, Sigmund Freud opened a practice in Vienna, modern field hockey was born, the London Times published the world’s first classified ad, Apache leader Geronimo surrendered during the last major US-Indian war, the first Civil Rights Act was passed in the US and Coca Cola was born (cocaine included!). Fast forward 126 years and this little house has seen some transformations. It now has aluminum siding, as seen in the above picture. There is a sunroom on the back of the house, that has seen better days. There’s different flooring in every room of the house. That might not bother you, but as far as aesthetics go, I will be changing that fact in the process of transforming this dated domicile into a thing of beauty. Uniformity goes a long way into the resale value of a home, in my opinion. So what else will I be doing? Paint will be applied. Landscaping will be attended to. 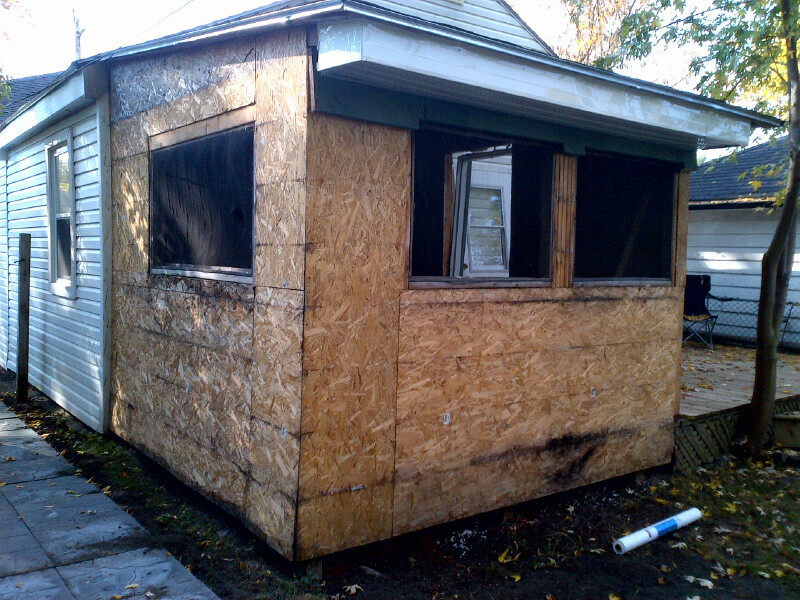 That nasty looking sunroom is on the list too. 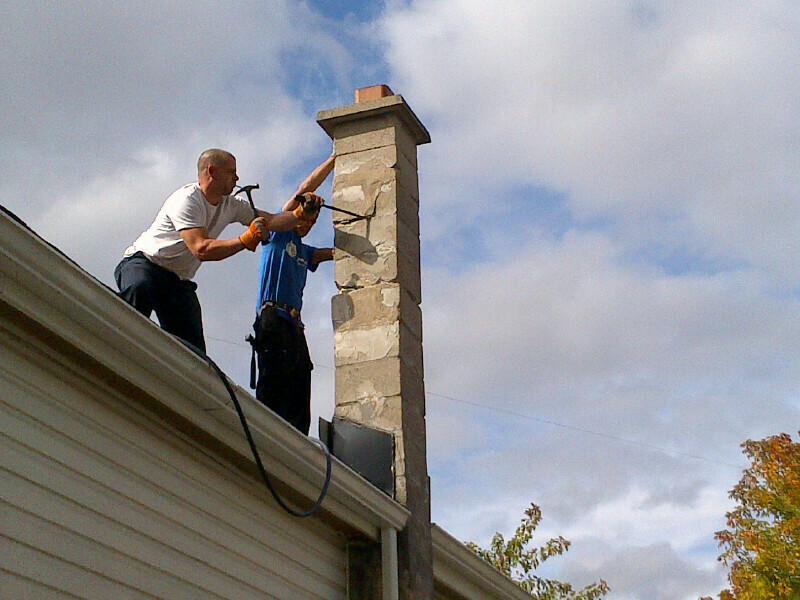 And that problem chimney? It has already been looked after by these two handy guys. We’ve got it all covered in my latest Follow the Flip! 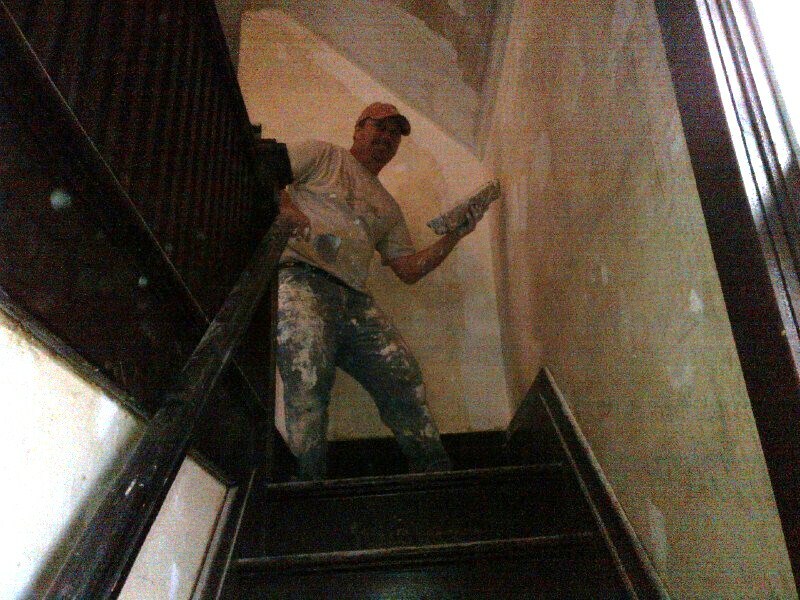 So make sure to follow along as I transform this historic house into a charming home once again. See you next time, for my FOLLOW THE FLIP 3! Are you tired of looking at the same four walls in your bedroom? Does your kitchen leave you a little flat? When was the last time you updated your living room? Even more importantly, do you really want to take on that project? It just might be time that you considered a move to a new location. According to a recent article by the Canada Real Estate Magazine, 1 in 4 people consider a move every 5 years. When was the last time you relocated? Are you in need of a change? Do your itchy feet have you browsing the MLS website, but not necessarily with the intent to completely remodel all the fixer-uppers that you find there? Let me help you out in that regards. Introducing, FOLLOW THE FLIP 3! Yup, I’ve done it again! This lovely little home is in need of a wee bit of TLC, as you can plainly see from the above picture. 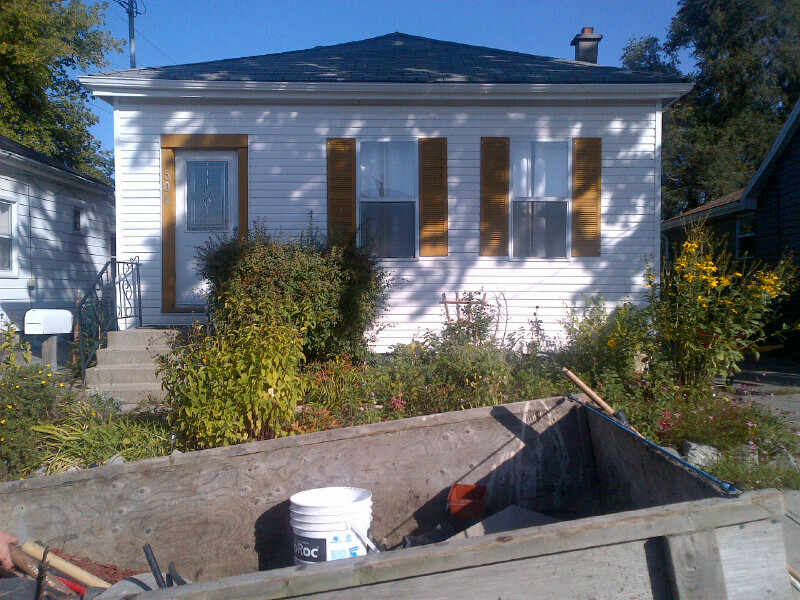 I plan to do a little of this, a little of that and completely renovate this gem! If you missed the first two FOLLOW THE FLIPS, be sure to check out the transformations here. In the meantime, settle in to watch the dust fly and get yourself in the mood for a change. Stay tuned for more details on FOLLOW THE FLIP 3 in the weeks ahead! Sign is in the yard on 509 Charlotte St! 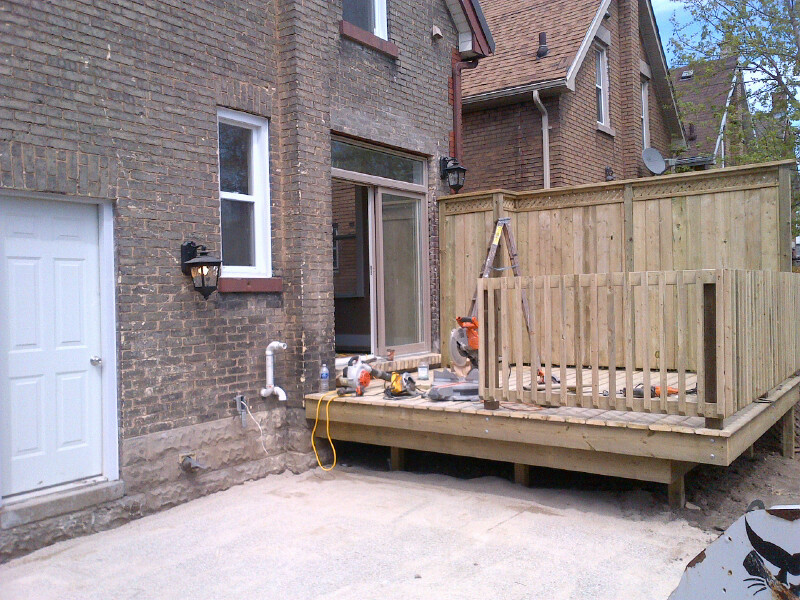 While the For Sale sign has been battered by the winds this week over on Charlotte St, it hasn’t stopped work from progressing around the corner at the house on Lorne Ave. That’s right, I haven’t forgotten about the other little project that I have on the go. In fact there has been a lot of progress over at my second FOLLOW THE FLIP home and today I thought I would share what’s new with my FOLLOW THE FLIP 2. 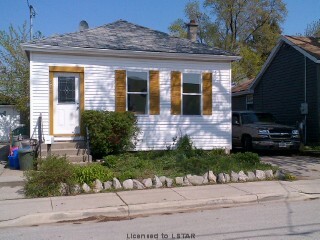 The last I mentioned, demo had been done on Lorne Ave and the process of putting the house back in order was underway. Well, you will be amazed by the transformation. Some of the many renovations that were slated to be worked on were updating the electrical, gutting and transforming the bathroom into a peaceful retreat, adding a sliding glass door onto the back of the house to bring additional light into the newly expanded kitchen, and so much more. As you can see looking from the front towards the back, the house has opened up a lot. What you see in the picture to the left is the makings of a beautiful eat-in kitchen with a sliding glass door that opens up to a brand new patio area. And when you look at the house from the back, you can now spy the brand new deck that was freshly built outside of that sliding door. Can’t you just picture yourself sitting under an umbrella at a little table sipping an icy cold margarita this summer? There is room for a barbeque too! The best part is that your yard will be an open slate, ready for you to plant your very own gardens to spruce the place up to your own specifications. Don’t worry about the inside though, as we are going to have that completely done for you. 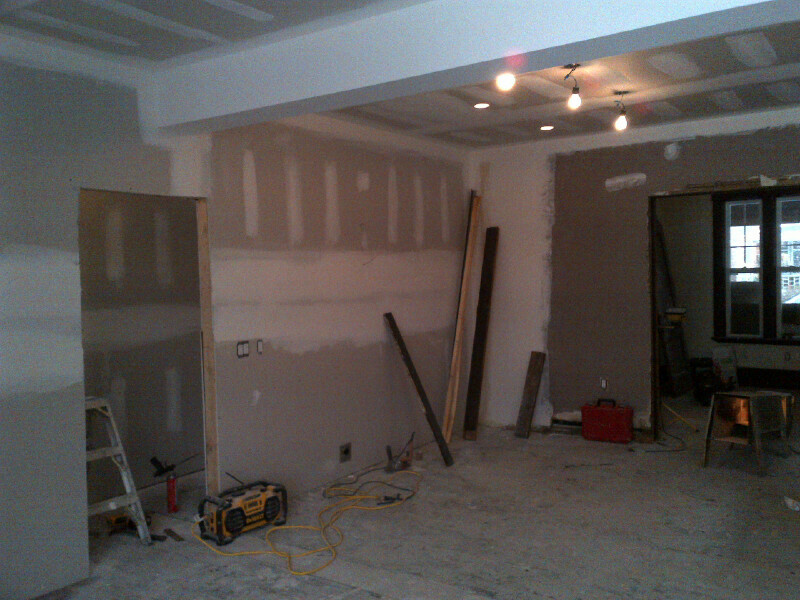 Back inside, you can see by all the tape lines that drywalling has been completed. As promised, the old knob and tube wiring is now a thing of the past as well. In fact, if you look closely, you can see where some fancy pendants will eventually hang above a custom kitchen island in the near future. 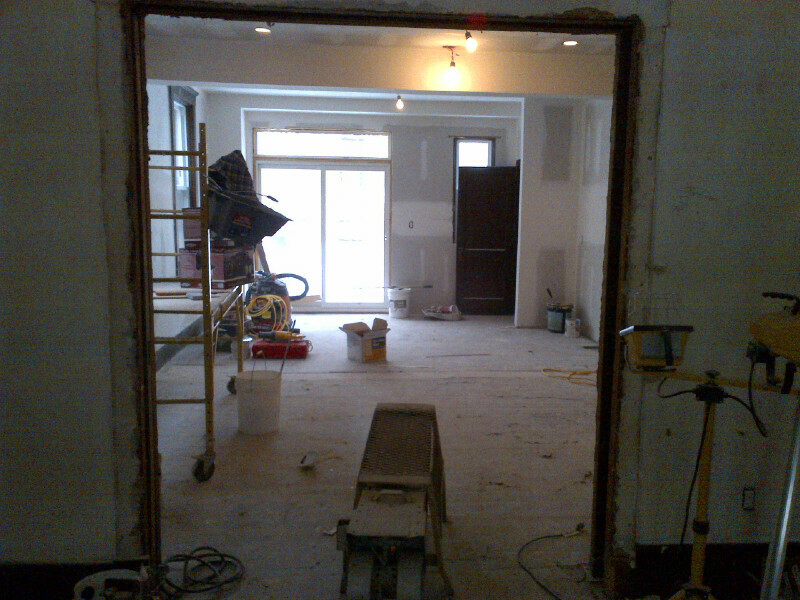 This kitchen is going to be bright, modern and the pièce de résistance of this home. That isn’t the only upgrade though. The bathroom has been purged of its pink tub and walls, and is now a clean white. The rest of the upstairs walls have seen their fair share of mud as well, including this corner of the stairwell seen on the right. There will be a fresh coat of paint everywhere upstairs (and down) and not a dust bunny to be found. We aren’t quite there yet though, so you will have to check back with us in the near future to see how the transformations are coming along. Until then, you are welcome to browse through the other articles in this blog, featuring DIY tips and projects, home decorating ideas, suggestions to help you succeed in the real estate market, and activities to see and do around London, Ontario. Lots to explore! See you soon! While it is nice to have the house on Charlotte nearing completion, that is not the only home that has seen a transformation in my FOLLOW THE FLIP stash. I might be busy doing other real estate things, but there has been a crew of guys working away on Lorne Ave., while I have been otherwise engaged. 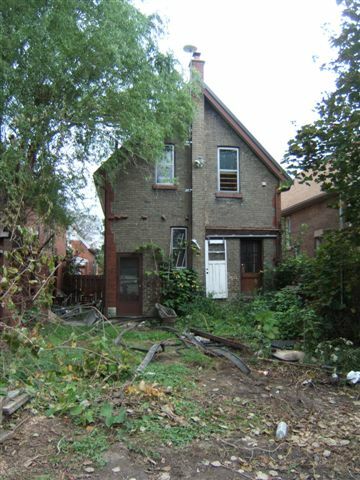 You might remember that this two-storey charmer was buried in weeds outside and saturated with junk on the inside. Would you care to see some of what we have discovered along the way at our FOLLOW THE FLIP 2 house? Let’s take a look! 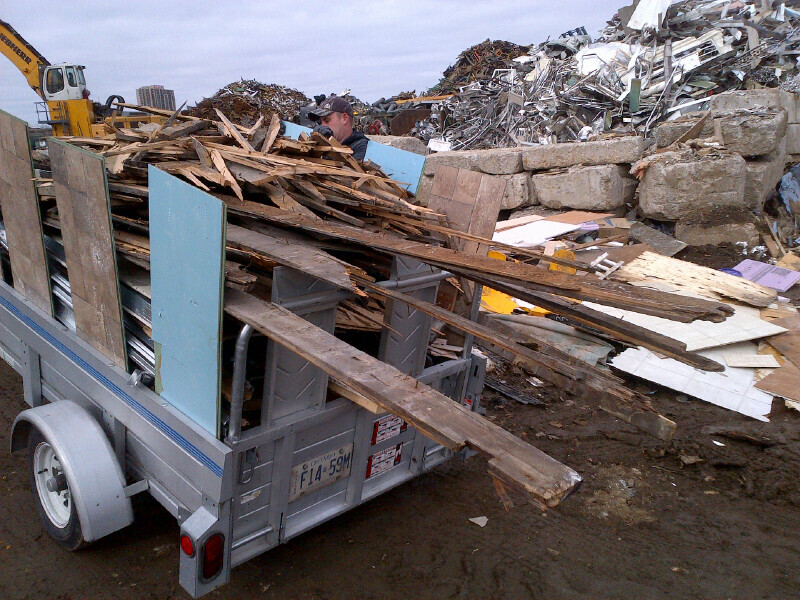 Here we have just one of the many loads of garbage that came out of Lorne Ave. You would not believe the amount of stuff that we found! There were over 50 television sets in the attic alone, not to mention the $180 we received from Try-Recycling for salvaged steel (and such). Where do people find this stuff? An even better question is why do they keep it?! Moving down from the attic, we step into the bathroom. Oh, nasty! Maybe we should just move along actually. Nobody wants to spend any time in a salmon-coloured cesspool with a tub that matches! So what else did we find in this century home worth noting? 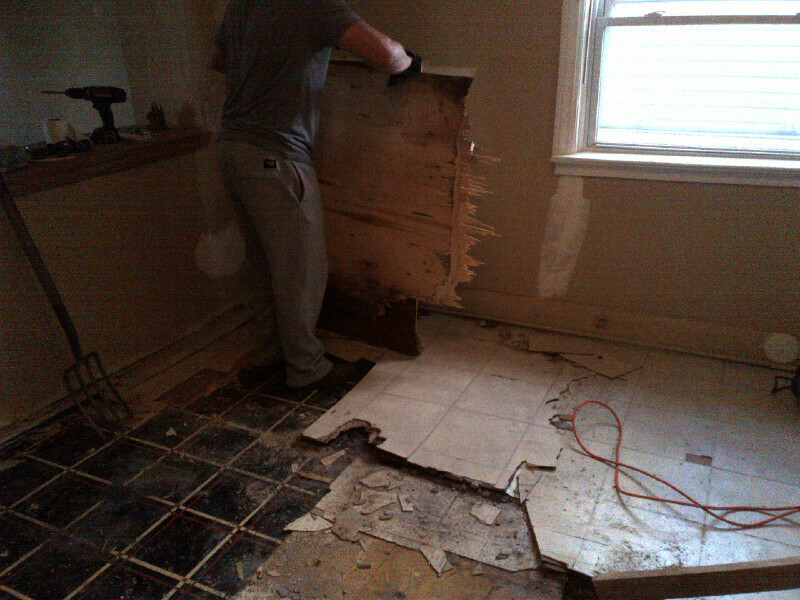 Well, there was some beautiful hardwood floors that should wow any potential home buyer, once they are cleaned up a lot. 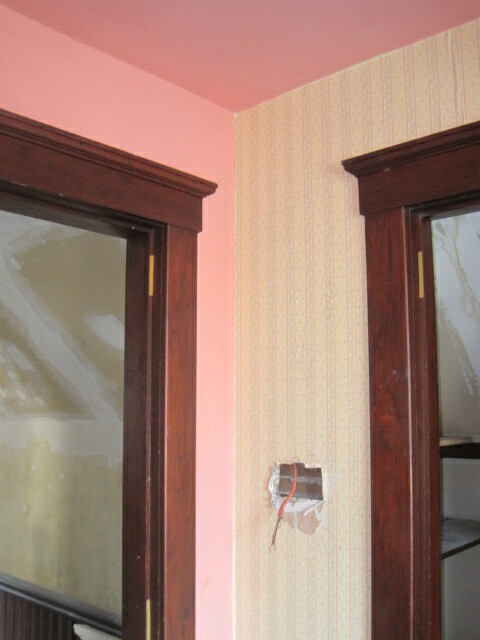 Plus the original fir trim was still intact and in good shape in several of the rooms upstairs. Don’t mind the pink paint and tacky wallpaper. It must have been for sale way back when, but we will deal with that long before you step into the house. And if the hole in the wall frightens you, don’t worry, as we will be taking care of that too. 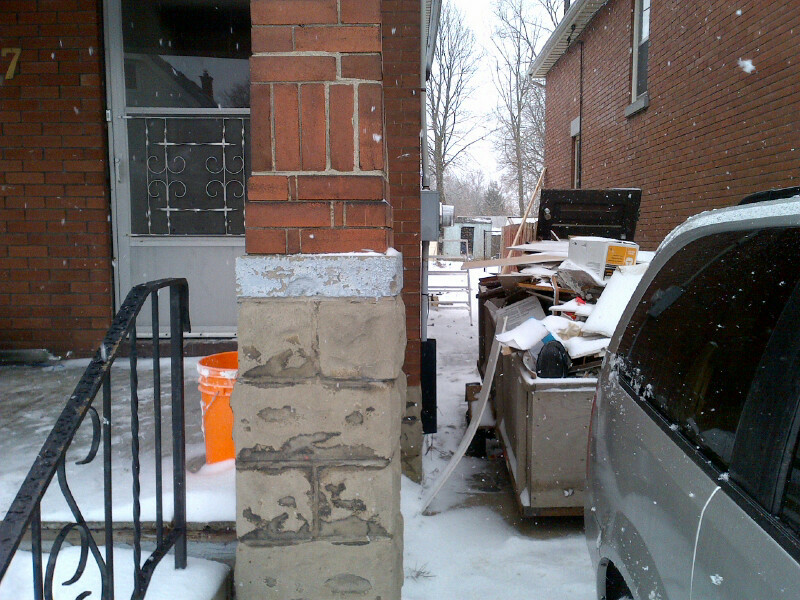 Knob and tube wiring was found here at Lorne Ave as well. I guess that goes with the age of the home, but modern insurance companies don’t look too fondly on the old-style electronics today. Nothing that my electrician can’t handle though, so don’t fret! By the time you move into this turn-of-the-century house, it will be up-to-date from top to bottom. I guarantee it! Before I scare you too much though, let me show you one of the updates that has already been attended to at the back of the house. When the keys were dropped into my hand, there was not one, but three doors at the back of the house. There was evidence of a patio, that had long since been taken over by the tangle of weeds that we slashed through. All of it was mismatched and so unappealing to even the least discerning homeowner, that we had to do something drastic. Observe the Before and After shots. Nice, hunh?! 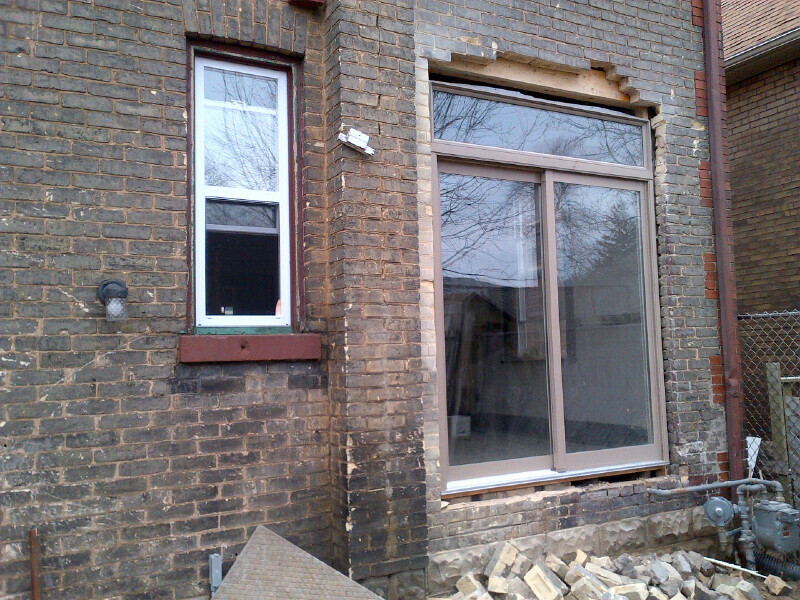 There is now a sliding glass door to access the backyard! And note the new window to the left of the door. That will bring a tonne of bright light into the home and afford a satisfying glimpse of the large back yard. Don’t worry about the rubble underneath, as that has been cleared away and the door has been properly sealed as well, I just couldn’t resist sharing this exciting addition with you. On that note, I should check in with the guys to see how the renovations are going this week. Have a great weekend!